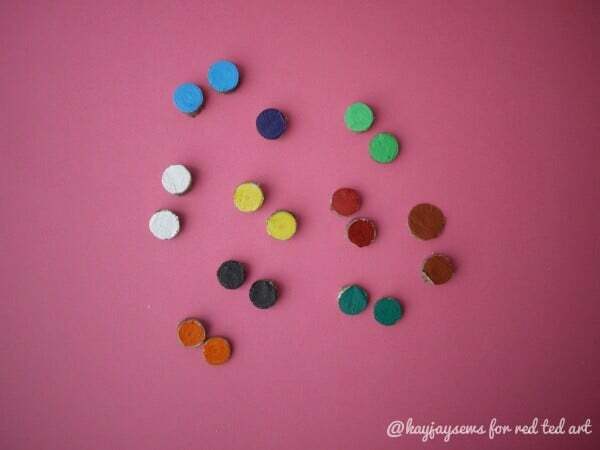 I have another LOVELY guest post from Karin at Kayjaysews. I spotted on Instagram some super simple and clever ?Christmas Tree upcycle? ideas ? yep, instead of ?throwing away your tree?, why not turn parts of your tree into fabulous Christmas family keepsakes, as well as rustic nature gift ideas for family and friends? I think these are a super clever and fabulous Christmas Tree upcycling idea! 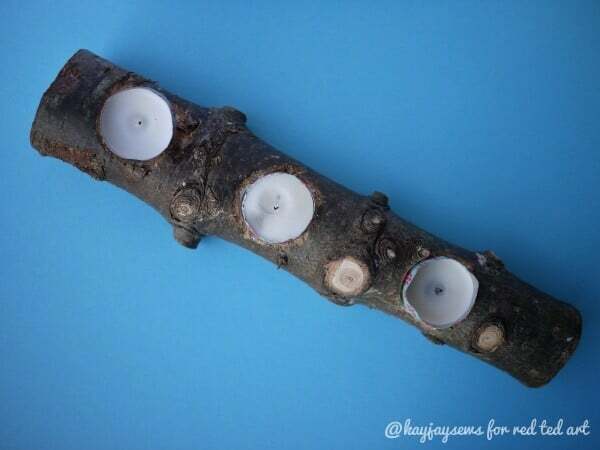 If you are looking for ideas of what to do with your old Christmas tree.. check these out! Be sure to PIN THIS so you remember to look at it after NEXT YEAR?S CHRISTMAS! Hi, it?s Karin from Kayjaysews again. This year, we had our first Christmas tree as a family of three and we wanted to commemorate that occasion not just by taking pictures, but by actually keeping a piece of our tree. Also, our council doesn?t collect the trees here, so you?re left to your own devices as to how to get rid of it. So in this bi-winning situation my husband brought out his Japanese Saw ? a little hand saw that does a rather smooth job. There are more expensive electrical saws too, of course. But for us, this one did the trick. For two of the ideas, my husband Tim used also a so-called Forstner Bits drill the size of a tea candle. You can see where this is going? Get your Forstner Bits Drill here ? 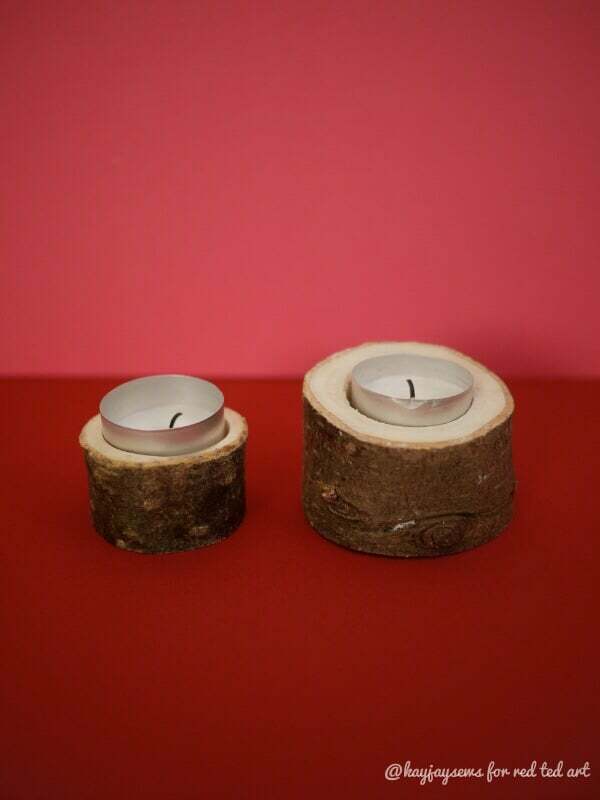 A tealight tends to be 38mm, so get a drill size of 40mm or a bit bigger. 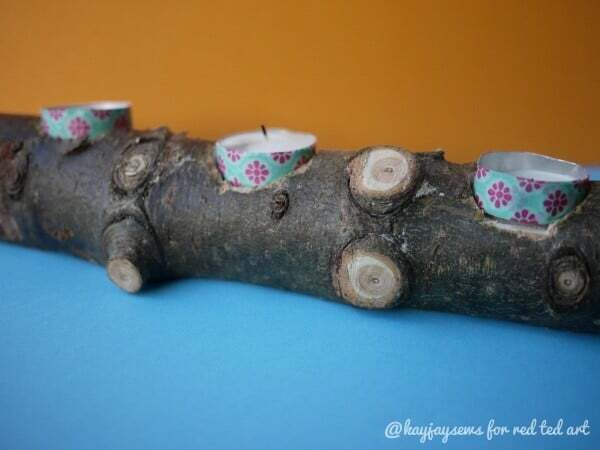 For these individual tea candle holders, just use a piece of trunk that is a bit wider than the tea candle. I think these are really gorgeous, if I say so myself. For the last two ideas, just the handsaw was used. 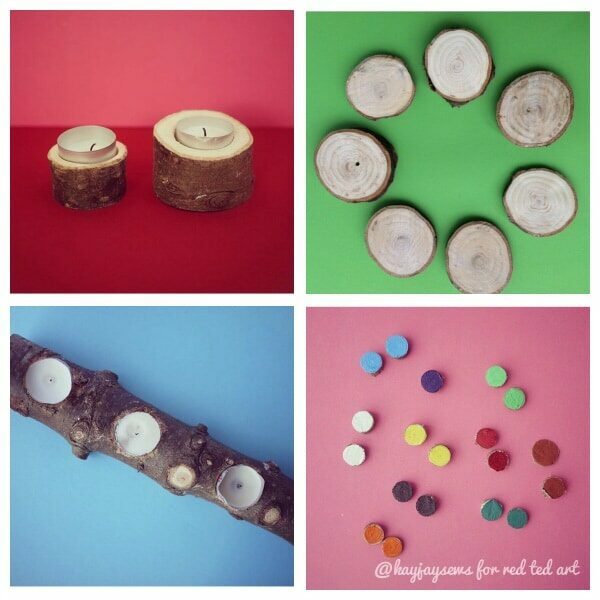 The first of these was just to cut off bits of a branch and as we have a little three-year-old at home and are into play-based learning, I thought it would be fun to paint some wood-pieces for her to do some free play with. There are always two of the same colour to play actual fish in the pond-type games with, but she also just uses them as her ?money? or stacks them, etc. I simply used acrylic paint, which is my favourite paint. I could also see felt pieces stuck on, etc. 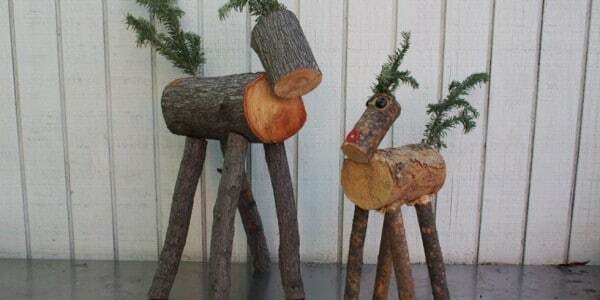 Make Reindeers from your old Christmas tree for your garden. Find out how here. 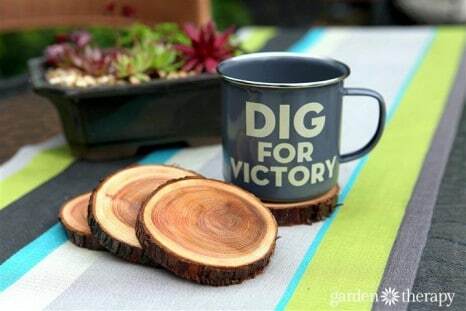 Make tree stump coasters from your old Christmas tree. More info here! 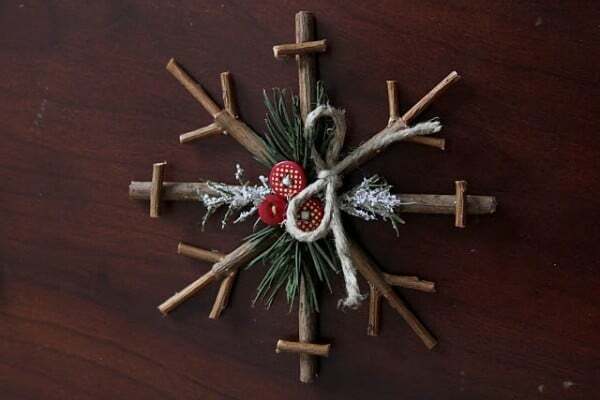 Turn your Christmas Tree into rustic snowflake ornaments ? find out more here! LOVE this Birdhouse Idea! What an amazing way to upcycle a Christmas tree! 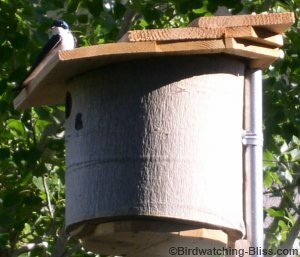 More LOG BIrd House DIY ideas and info here! I hope you have been inspired to look at your old Christmas tree in an entirely different way this year and that you know what to do with your old Christmas tree.. other than just throw it away! 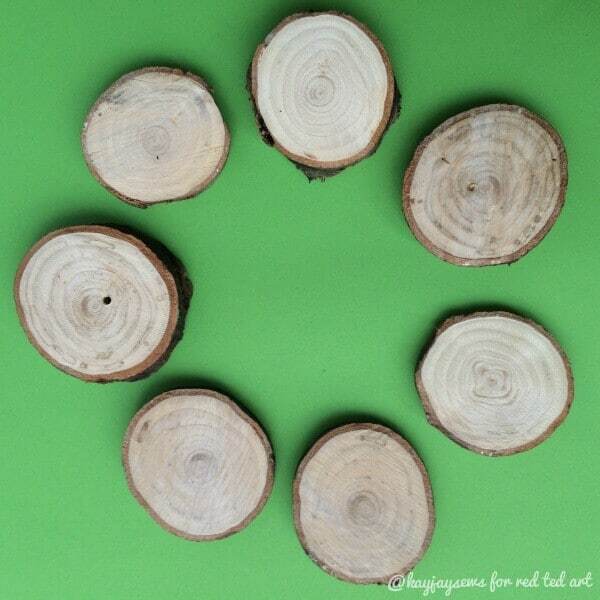 Get crafty and do some great Christmas Tree Upcycling projects! !